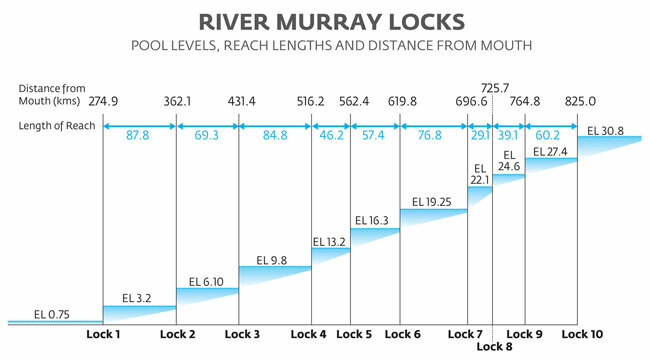 Water levels and river flows are managed using a series of 14 weirs along the River Murray. They allow water to be stored during wetter times, so releases from dams and water levels along the river can be managed, and water can be delivered when and where it is needed. There are also three large storages along the River Murray that are used to manage river flows and hold water to meet the daily demands of irrigators and towns. They are Dartmouth Dam, Hume Dam and Lake Victoria. Menindiee Lakes on the Darling River also play a role in managing flows into the River Murray. Lake Victoria is located just above the South Australian border and is used to store and regulate flows to South Australia. There are nine locks and weirs used to control the flow of water between Lake Victoria and the Murray Mouth which are operated by SA Water, six of which are located in South Australia. There are also five barrages located near Goolwa, which manage water levels and salinity in the Lower Lakes, and the flow of water through the Murray Mouth. Historically these structures have been used to maintain relatively stable water levels for navigation and irrigation, which has impacted on wetlands and floodplains that would naturally experience cycles of wet and dry. 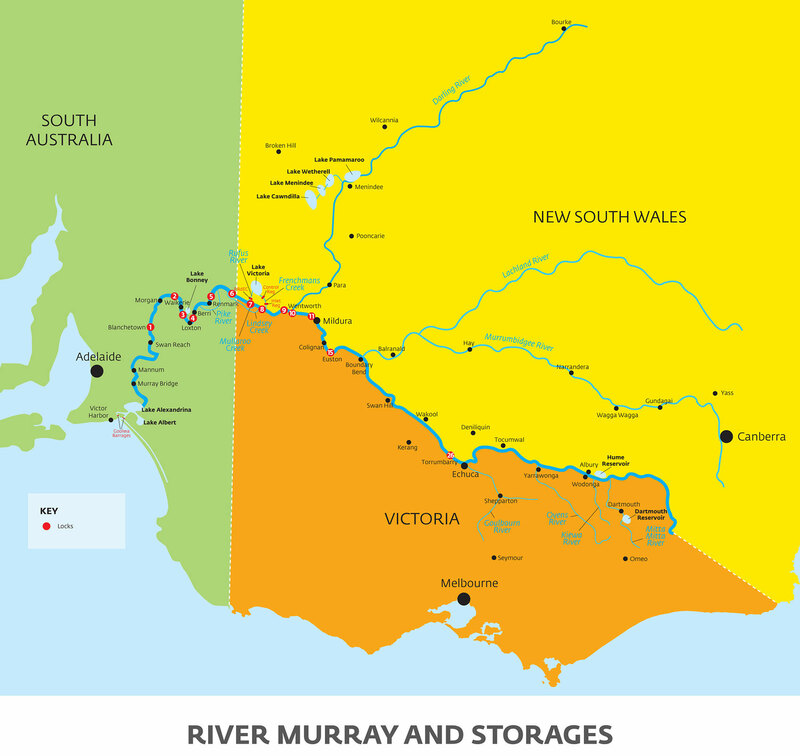 Under the Murray-Darling Basin Agreement, the Murray-Darling Basin Authority manages the sharing of water between the states, and the dams, locks and weirs along the river to meet the state’s needs. The South Australian Government manages the river and regulating structures on a day to day basis downstream of the South Australian border, with advice from the authority on expected impacts of upstream operations. 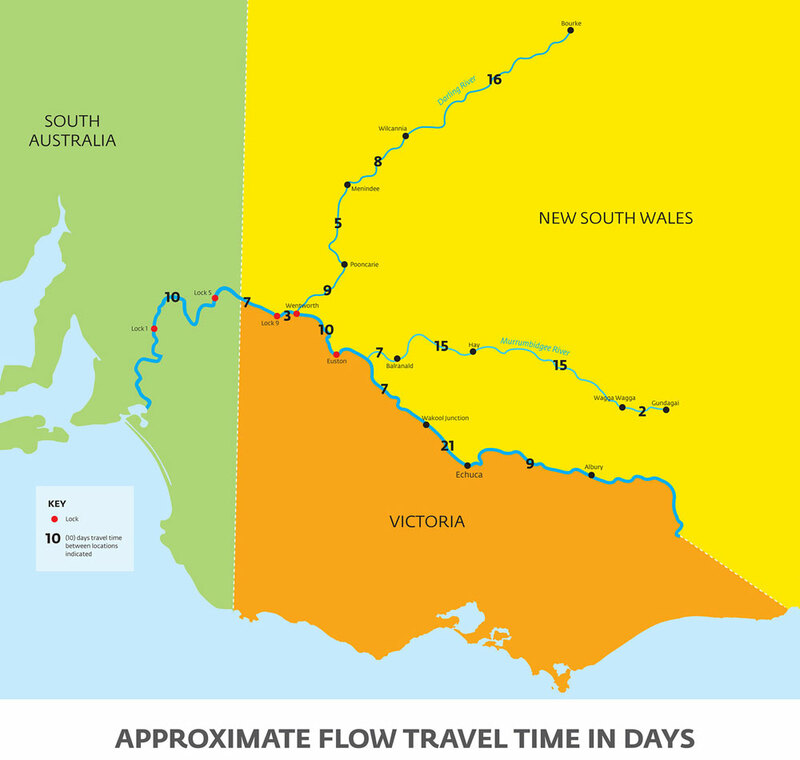 It can take about two months for water to travel from the upper river to South Australia, which is an important consideration in managing the river, particularly during times of flood or drought.